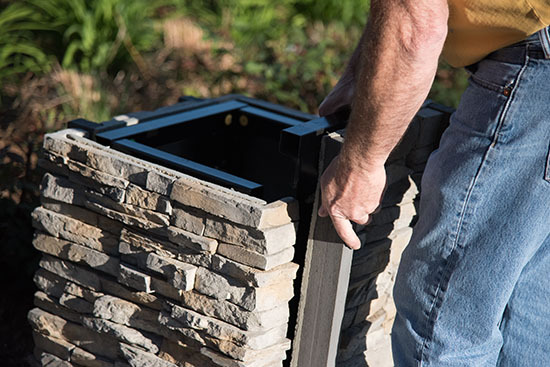 Quarrview Propan/Natural Gas Fire Pit - Mid-Atlantic Products, Inc.
QuarryView propane/natural gas fire pits features masonry planter pedestal bases and arrive fully plumbed. Each pedestal consists of four separate panels using hand laid courses of thin veneer which are bonded to a powder coated light weight steel frame. 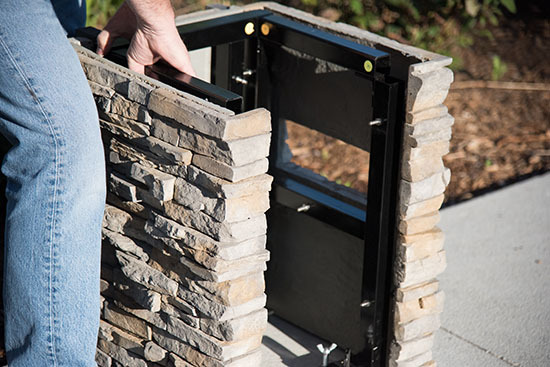 Panels are easily assembled by hand and do not require any tools. QuarryView Stonework is perfect for natural settings and pairs great with planter beds and foliage. SAFE OPERATION OF THIS PRODUCT IS PARAMOUNT, therefore all burner systems are UL Listed. A comprehensive, 14 page document is included with fire feature upon purchase. IMPORTANT: Installation of Natural or LP gas should be done by a qualified installer, service agency or gas supplier. This appliance must be isolated from the gas supply piping system by closing its manual shutoff valve during any pressure testing of the gas supply piping system at test pressures equal to or less than 1⁄2” psig (3.5kPa). Fire features are shipped with all but two (2) completed connections within the fire feature itself. 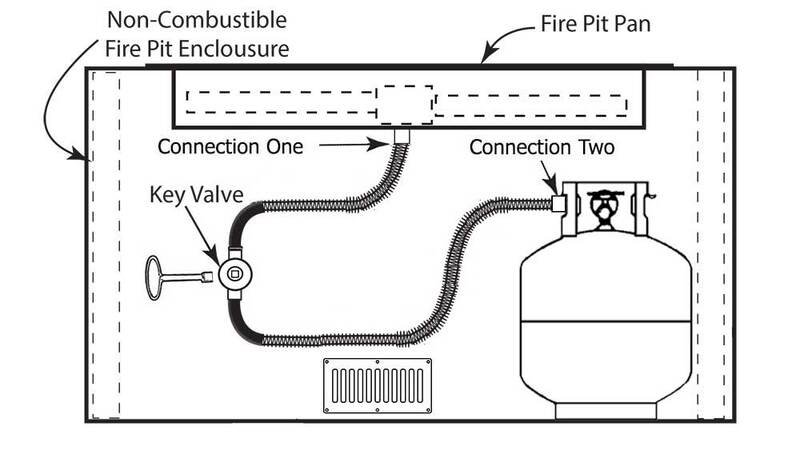 Installation will require connecting the gas line that leads from the gas valve to the underside of the burner, and the line that leads from the gas valve to your gas supply. Make sure to use PTFE on the threads at these connection(s). This fire pit requires cross ventilation to ensure no possible build up of gas under the burner. The body of the fire pit was designed with the proper amount of free area to ensure adequate ventilation. QuarryView propane/natural gas fire pits are turn key ready. Choose wood burning, propane or natural gas; 16inch or 20inch height; optional slide out drawer for 20inch models; choose glass color; stone profile; and accent color. Linear Fire Vessel 2 - 42"
Linear Fire Vessel 2 - 60"
Linear Fire Vessel - 42"
Linear Fire Vessel - 60"